I was really confident the boys would continue to fight. THIS St Kilda side refuses to wilt. Down by 26 points in the third term, with concussed defender Daniel McKenzie missing most of the second half, the Saints were inspired by pint-sized forward Jack Lonie and a stellar showing from stand-in skipper Seb Ross to edge Hawthorn by five points. It's only fair to point out the Hawks faced massive challenges. Their barebones midfield lost Jaeger O'Meara before the game to a left hip corkie, adding to a list of absentees that included Tom Mitchell (broken left leg), Shaun Burgoyne and Liam Shiels (both with hamstring strains). Then, captain Ben Stratton and key backman James Frawley went down with concussion and left hamstring problems respectively. 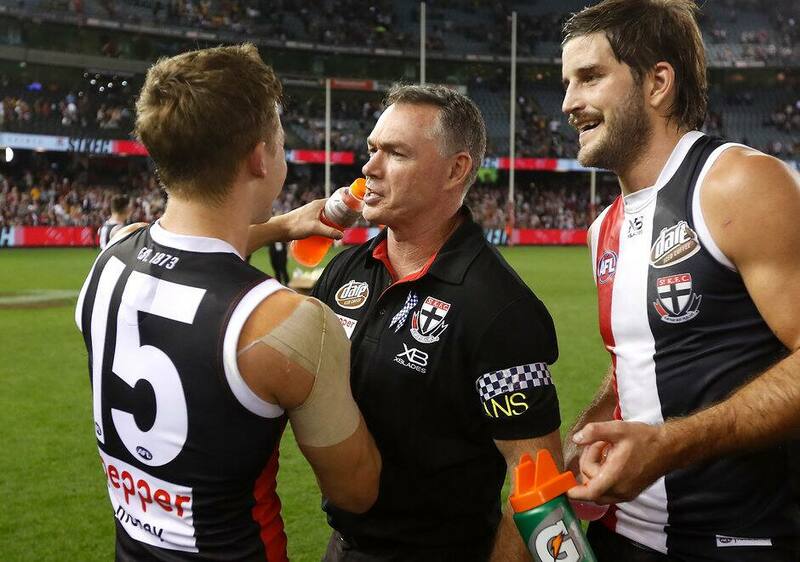 Let's not ignore those sidelined for St Kilda though. Hard-nosed defender Jarryn Geary withdrew 20 minutes before the game with a virus, adding to a list of those missing that includes four-time best and fairest Jack Steven, triple All Australian Dan Hannebery, the club's two best backmen in Dylan Roberton and Jake Carlisle and the No.1 draftee from 2014, Paddy McCartin. Amid that monumental challenge, and their continued inaccuracy (2.5 in the final term), the Saints of 2018 would have fallen away, and fallen away badly. Their coach Alan Richardson knew that wouldn't happen on Sunday afternoon. "I expected us to fight back," Richardson said. "Were we going to be able to put that on the scoreboard? That's the challenge for us at the minute. We're not quite maximising our effort in front of the ball. Lonie, he could've had an amazing day really (he booted 3.5) … that's still a challenge for us, but I was really confident the boys would continue to fight. So what's different with this group? For Richardson, it stems back to an arduous pre-season which saw the players pushed to their limits. Whether it was completing sprints after an intraclub in February as the sun beat down at RSEA Park, or completing a beach tackling session that the players described as perhaps the most gruelling and intense they had done, there was no respite. Now they're reaping the rewards. "Fundamentally, the guys have got really strong belief in their legs," Richardson said. "They believe on the back of incredibly hard work, that they're a hard-running team, and so we're never going to be out of the game. "We're going to be able to end up with really good numbers at contests because they're going to run well. "I think they've also got a lot of belief in each other now because of this improvement that's starting to come with players that have been here for a while." The next test awaits. Melbourne, next Saturday, at the MCG. Richardson was hopeful Steven would return, while Geary should be fine. Regardless of who the Saints put out there, expect a team that won't give up.